The apprentice pursed her lips, thinking. In the lull, the two guided the crate into its slot then retracted the mover and began hovering over to the next job. Finally, she spoke again. “Say… what if we’re NOT carrying them around?” She looked over sideways at the older man. He scratched his head, skeptical. “I don’t get it, how else would they show up everywhere? 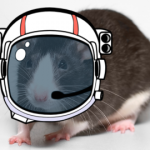 Little rat spaceships?” He laughed then, pantomiming tiny spaceships flying around. He hurriedly grabbed the controls as the cargo mover began to drift off track, but kept chuckling. The cargomaster’s chuckle slowed, then stopped. They continued over to the new crate in silence and began loading it. He cleared his throat. “You know… maybe… maybe you’re right, maybe you’re wrong, I don’t know. But I know these dang crates won’t load themselves so let’s just concentrate on getting the job done. You go ahead and take care of this one, I’ll supervise.” He handed over the control collar to her and stepped back, pulling a quick swig from a hidden flask. 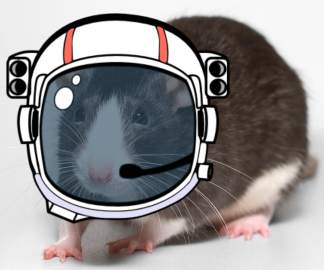 Space rats! Ridiculous. A nearby bush wiggled, and a pointy nose stuck out just long enough for its owner to check out the scene for food. Nothing good over there today, but it knew to check later. It had plenty of time, and there were so many good things to eat. The new people brought such wonderful things.